It’s been a busy year, but I will try to keep up with the posting from now on. 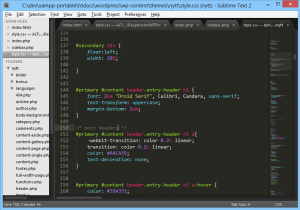 This post is about an excellent text editor named Sublime Text 2. Sublime text is an advanced text editor, like Notepad++, which has a plethora of functions. It works well editing everything from plain textfiles to medium large code projects. Large base of plugins availble, for everything you might need, such as git integration, ftp integration etc. If you know python, you can easily make your own plugins too. For example, using the ftp plugin, you can set Sublime Text to upload files to your webserver, on save, to instantly make your changes available online. I have been using my lisenced version of Sublime Text 2 for developing my extensions for Opera, and for editing PHP projects and WordPress themes, and It is a joy to work with. Sublime text is available for Linux, OS X and Windows, and can be downloaded as installer or a zip file for portable use. Changelog is also available.